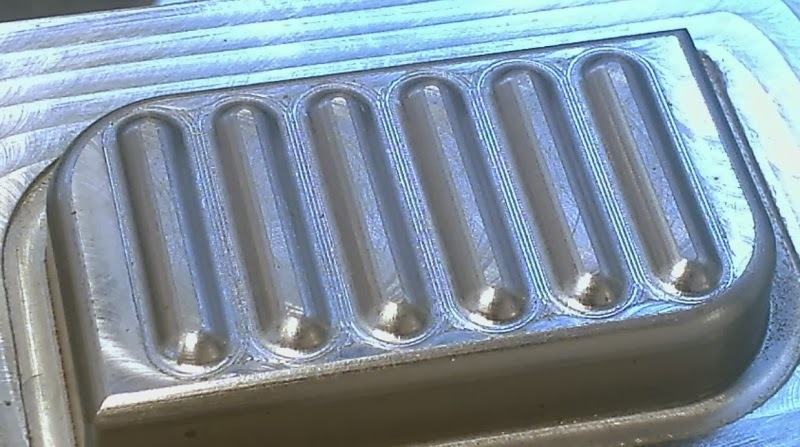 The next thing required were the runners for pouring metal into the soap dish cavity, I milled them in with a 3/4" ball end mill and the smaller ones with a 1/2" ball mill. I chose to have a long sprue going to the bottom to utilize the power of gravity. 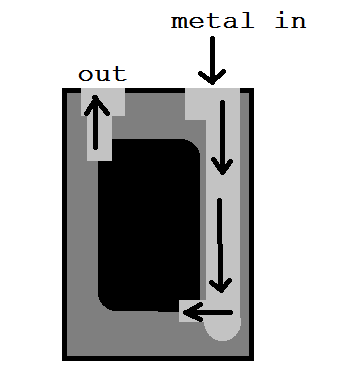 This is also preferred because the force of the metal flowing down is abrasive, and this offers a sacrificial channel so the actual mold gets ruined less. Speaking of which, it was actually a good thing that I accidentally milled the mold .1" off center because it gave me more room to cut the channel. Also I'll get a free piece of 3/4" round stock with every casting. Next I drilled #7 holes for ejector pins to and counter bored to .281" Unfortunately, the mill head wasn't perfectly aligned so some of the holes were off center a little. This is what I get for using a free drill chuck, it fell off the arbor while drilling... though the chuck continued to spin around in the hole for a good few seconds afterward. I didn't have a #7 drill long enough to go through the whole thing, so I used a long l/8" drill for a pilot hole and drilled through on both sides. Next, for the actual pins, I bought some 4.5" long #10-32 machine screws and turned the heads to make a flat disk and faced the back with a grooving tool. For the two holes that were a bit off center, I sanded down the threads toward the head to get it to fit in the counter bore. I don't think there will be a problem with them leaking, I've had trouble trying to get metal to flow through a 3/8" diameter cavity. They will just leave 4 little circular impressions on the bottom of the soap dish that are common on a lot of molded items. Then, after much sanding, I managed to polish off the tool marks. This is so the soap dish doesn't get stuck in the mold, also so the tool marks aren't transferred to every finished part. Then I finished it with the buffing wheel, though it didn't seem to do much. Then I welded together some ejector handles from some tube and 3/8" threaded rod. Before welding, I re threaded them with a die, inadvertently stripping the galvanized coating which made it less deadly to weld on. These go in the bottom half of the mold to push on the tops of the dowel pins to allow it to separate. I really hope the soap dish sticks to the top half as planned, because I didn't put any ejector pins in the bottom. The halves with attached hardware. Also notice the reservoirs milled in the top, I think they are too small for massive splashes of molten aluminum from the crucible. Now Let's fire it up!